After the installation of GRASP software, the grasp command will be available. As it is explained in a previous section (see Section 3.6, “Running the code”) just typing grasp will print some general information about how the software was compiled. First arguments that grasp executable expects is a path to the settings file. The settings file describes the inversion strategy and general behaviour of the process: where is the input data, in which format is the input data, where to store the output results... Therefore, a deep knowledge of the settings parameters is the base to understand GRASP. x: 2 # It defines the maximum size of x dimension of the segment to 2. When grasp is called, the first step is to read settings and the second is to prepare the environment for the settings defined in the main structures. If the settings are not valid, an explicit error message will be printed. Please read the first line of it carefully to understand the error. It is important to define clearly how the relative paths have to be defined in the settings files. Relative paths are always relative to the file that defines it. In the next section, the reader will learn about how to include other settings file inside of a settings file, but this rule will stay valid: Relative paths are defined from settings file that define it. In the case of usage of command line, relative paths are relative to the current working directory. In the case of absolute paths, all this complexity disappears but the results are less portables. The list of available parameters for GRASP is long. The "help" argument will help you to know the available parameters or to look for something specific. When help argument is present, GRASP is not executed normally, but instead, the help information will appear in the screen print. Additionally, help can be followed by a search string to filter the results. For example, help=input will print only the settings which contain "input" string in its definition and help=input.segment will print only the settings which will be under the block "segment" inside of the block "input" (because "dot" symbol defines block separator). retrieval. radiative_transfer. molecular_profile_vertical_type It defines which model will be used to describe vertical profile of molecular (Rayleigh) scattering. Values: 'Exponential' describes molecular density profile at altitude h as exp(h/8)/8, 'Standard_atmosphere' uses standard atmosphere model (pressure and temperature profiles) to calculate molecular density at each altitude. retrieval. radiative_transfer. aerosol_profile_vertical_type It defines which model will be used to describe vertical profile of aerosol distribution. Values: 'Exponential' describes aerosol concentration profile at altitude h as exp(h/HM)/HM, 'gaussian' uses normal distribution exp(h-HM)/(sqrt(rpi)*sqrt(2. )*sigma) with sigma and HM parameter taken from parameters. retrieval. debug. path_to_extra_files Path to folder with retrieval extra files: debug information, extra resources like image. dat files. . .
input. sdata. dump_original Stream where to dump sdata information just after being generated by the driver. Some transformers can modify sdata information, this setting is thought for debugging purposes where the user is interested in knowing sdata generated by the driver instead of data driving inside the inversion. The first argument of GRASP has to be the settings file but this file can be modified by another mechanism proposed by the settings module. The main way is by the command line, which allows to replace every settings parameter with "dot" syntax (replacing indentation by "dot" symbol and colon symbol by equal). All parameters that have been defined before and being replaced in the command line will cause a "note" information during the execution of GRASP. That sentence is just to inform the user that command line arguments always have higher priority than parameters in settings files. The value from command line will be the value that will be used to run the code. The command line is a very powerful feature to be used in the production scripts. But the command line is not the only way to modify GRASP settings files. Settings files accept "import" and "template" statement. These statements could look similar but theirs behaviour is a bit different. Both of them allow defining other settings files that are read before the current one, but in case of import, the settings can not be overwritten. The template statement allows loading other settings files and then, modifying some settings to customize the loaded file. It is necessary to take into account that these statements can be used in cascade, creating problems to debug the code. So please use these statements carefully. In addition, wildcards will provide the user the capability to set some system streams. If you use the values "true", "screen", "t" or "1", the information will be printed in the terminal (stdout). If the stream is set to "false", "none", "null", "f" or 0, nothing will be printed (like redirect to /dev/null). Finally, using the value "stderr" or "-1", the output will be redirected to the standard error output. To know all the details about the products obtained by GRASP, please see Section 4.3.1, “The list of GRASP output parameters”. The input module is responsible for reading the data and for setting the internal input data structures. GRASP provides a very flexible way to inject the input data offering developers the capability to create the input drivers. An input driver is an extension of GRASP that is added during compilation and is selected in the settings file. These generic drivers allow the developers to create a custom way to read a specific database and load it into the GRASP scientific algorithm. Therefore, GRASP can read infinite kinds of input databases, as much as drivers exist. Additionally, drivers can take the responsibility of performing some pre-processing actions (such as calibration corrections) before retrieving the data. Finally, when GRASP is used for massive data processing, drivers are extremely important since they help to prepare input data and load it into scientific module without the use of any intermediate files, everything is performed in memory. For general use, GRASP proposes a generic driver called the SData driver, which reads files in SData format (Sensor-Data format). These files are not standard, they have a specific format proposed by GRASP to start working with the code. This format is described in Section 4.2.1, “The SDATA format”. Transformers are the second kind of extensions that the input module offers to users (and developers). They are called after getting input data for a segment, it means after calling the driver. The purpose of transformers is to add the capability to modify the segment after obtaining the data. 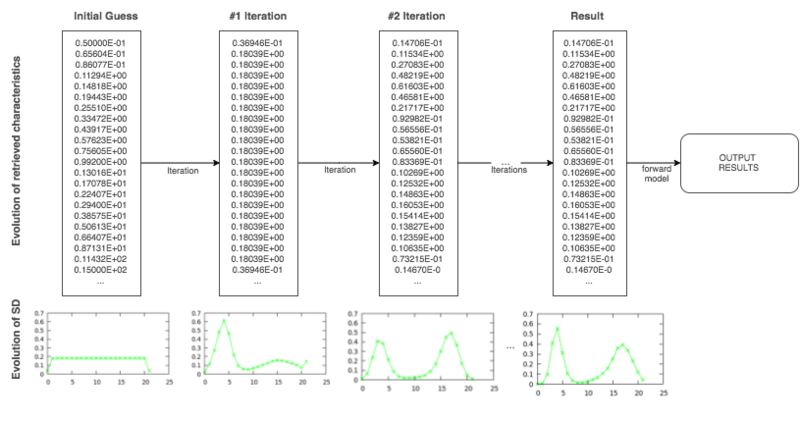 An example of transformation is to load a climatology database and to modify the initial guess of each pixel to optimize the number of iterations needed to retrieve the data. Performing this action after getting the data allows reusing it between different drivers. Default installation of GRASP does not offer any transformers. All of them are considered as optional extensions and have to be externally added manually or using the grasp-manager. The SDATA (sensor data) format is the original input data format of the GRASP code. It is a simple text format designed by the science team at the early stages of the development of the scientific code and it's the easiest way to create test data. Designed by the scientific team at the origin of the GRASP project, it is well adapted to its needs. It is very simple to describe. It is a text format, and therefore portable, quite easy to check (for the accustomed eye!) and to edit and to make some quick experiments. It is not standard (a by-product of the "not designed by a committee" approach). No off-the-shelf library is available to parse it and validate it (meaning outside of the GRASP project). It lacks of flexibility: the order and the number of values are fixed for one version and any change in the format to meet new requirements is likely to break the compatibility with the former versions. It is fragile: a malformed file may easily make the code crash or produce mysterious bugs. The design of the format, while simple, makes it hard to develop a really reliable validator. While the format uses a text representation for the data, it contains lots of numeric values, with limited accuracy and with no comment. Large files are tedious to read and it's easy to make shift errors while reading and editing even for the experienced user. Being a text format, it becomes very inefficient for large data volumes. While it can be compressed for archiving, it must be uncompressed for processing, and only sequential access is possible. It is still possible to perform regional processings (several dozens of thousands of pixels that cover more than a few hundreds of kilometres in both directions) with this format (it was actually done for the sake of necessity), but it stresses the computing system a lot and can't be scaled up to the global processing. Whatever the number and seriousness of the cons, one of the design objectives is to keep the code simple and flexible allowing the scientific community to play with the code. It does not make sense to implement a driver for a single user who wants to do some tests with GRASP. That's why this easy format is maintained by the developer team. In the following description, the elements in fixed-width font are the snippets of content. The numeric values in these snippets (e.g. in 2 2 2 : NX NY NT) are given only as examples. The first line is the FILE HEADER. It contains a magic identifier SDATA followed by a version number. The second line is the SEGMENT HEADER. It contains three numbers, NX, NY and NT, the spatial and temporal dimensions of the segment that this SDATA file represents. You can notice a colon and names of fields after the values. This is the way how comments are written in the SDATA files. Everything starting from the colon will be ignored by the SDATA parser. An empty line follows the SEGMENT HEADER. Then comes the first CELL (group of neighbouring pixels) of the SEGMENT. Each CELL has at most NX*NY pixels (but it may have less, for various reasons: cloudy pixels that have been filtered, missing pixels, etc.). The number of CELLs in the SEGMENT is given by the NT number provided in the SEGMENT HEADER. A CELL is a set of neighbouring pixels, that form the base of a SEGMENT. Each CELL has a HEADER and a number of PIXELs, supposedly acquired at the same time. The timestamp of acquisition of the pixels, in the ISO8601 time format. A "height" of observation, in metres. The value here is a bit weird (70000), and doesn't correspond to the satellite altitude (that is at least 10 times larger). Actually, the value doesn't really matters as long as it is large. Historically, the scientific team has used this value of 70000 in many SDATA files. Two values for the number of surface and gas parameters. These two values are currently not documented and can be set to 0 for the moment. Comments starting with a colon. Each line of data after the CELL HEADER represents exactly one pixel, with all its fields. The Table 4.4, “The PIXEL structure” describes the order and type of these fields. For the types, the Fortran notation is used: array types are described with the dimensions of arrays between parentheses, and the ordering is such that the first index increases faster. Indices start from 1, not from 0 like in C. For instance, when one reads real(nwl) for wavelengths, that means that one has to read a list of nwl real values that represent wavelengths. In case of lidar or vertical observations this field contains altitudes or ranges of the observations in meters. gas absorption (tau gases) or molecular depolarization ratio. This parameter has to be provided only if the setting IFGAS (in the CELL HEADER) is set to 1. [a] This fairly counter-intuitive coding has a reason: the cloud flag was at first intended to be a general processing flag (0 = pixel not to be processed, 1 = to be processed), cloud contamination is only one particular case. Now the flag is limited to cloud screening, but unfortunately the coding couldn't be changed right away. Since the framework is still in development, it is planned to correct this unnatural feature in the near future. [b] These fields are actually not used by the processing and therefore the SDATA implementer is free to put whatever he or she likes here (e.g. 0 for non-gridded data). They are intended mainly for documentation and debugging. For satellite data, they make it possible to retrieve the pixel original information in the original database. [c] nbvm is actually to be multiplied by ifcov(ip, iwl). If this last number equals 0, the array reduces to an empty set and no value is to be read. [d] nbvm is actually to be multiplied by ifmp(ip, iwl). If this last number equals 0, the array reduces to an empty set and no value is to be read. This chapter main goal is to describe how the angles should be defined to be used inside of GRASP code. The universal spirit of GRASP, where many different instruments coexist (from satellite to ground based measurements), creates challenges to define a homogeneous way of defining the angles, keeping a unique geometry. 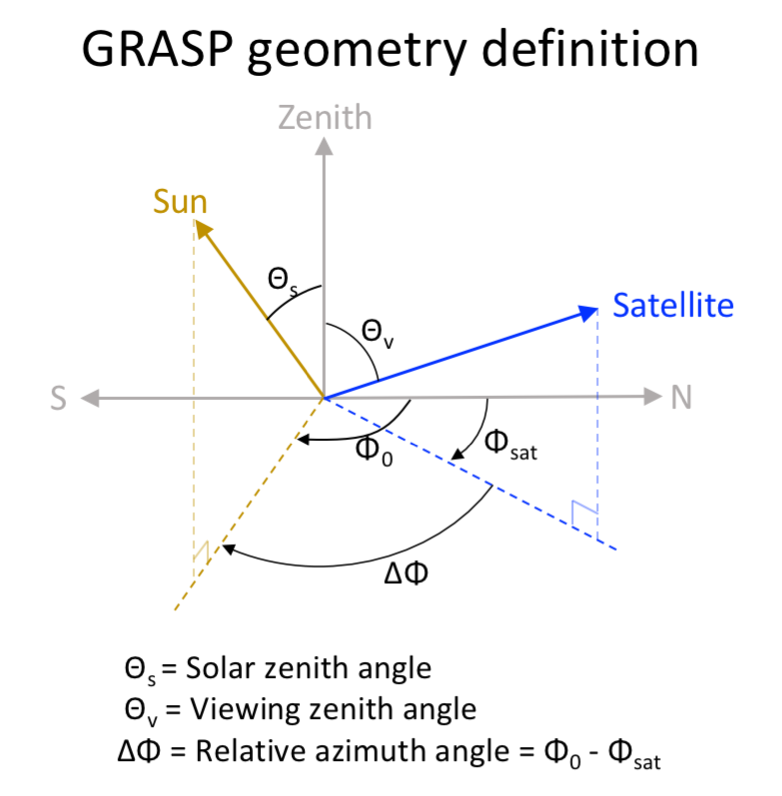 As it is shown in the figure Figure 4.4, “Definition of GRASP geometry” GRASP angles are defined to be considered as "normal" for satellite reference. where the sub index "gb" makes reference to "ground based". Here we propose some examples for better understanding of the process. Before defining the measurement angles introduced in the code, both "intuitive" and "GRASP", we need first to consider the instrument viewing angle for each scenario (θv, ϕv). The following figure and table will provide some examples of angles defined for the ground based applications. [d] The data of the polarized principal plane correspond always to fixed points in the sky and it is given for the instrument in so-called ground based coordinates. Sunphotometers are widely used with GRASP. They take measurements of sky radiance and direct sun. 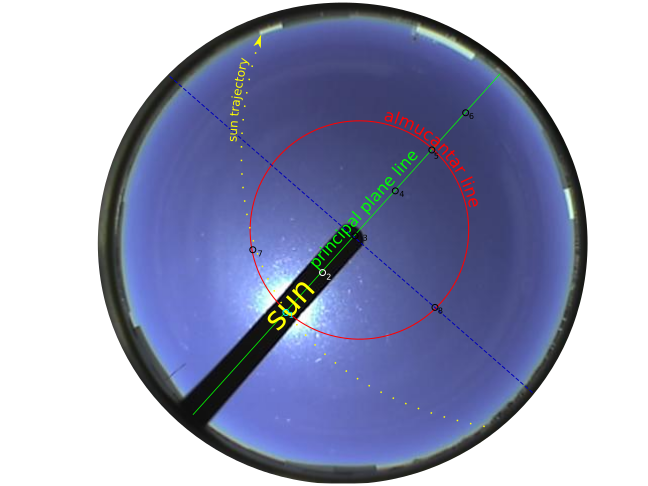 Many inversion strategies can be used to retrieve sunphotometer data, but this section will explain how to define input data. The information that runs inside of GRASP has to be pre-processed in order to screen clouds, calibrate and normalize the data. Following Section 4.2.1, “The SDATA format”, the direct sun measurements can be described as AOD or TOD defined in Table 4.5, “TYPES OF MEASUREMENTS” as measurements of type 11 or 12. At this point it is needed to take into account that if "ifgas" field is defined as 1 in the case of AOD, no gaseous absorption optical depth will be accounted, but in the case of TOD they will be subtracted. The gases also affect the radiance measurements but in lower magnitude. In the case of TOD + radiances with ifgas=1, the same model will be applied to all measurements. If AOD is used, some (minor) incongruences could come from the use of different models to calculate gases for AOD and for radiances. Radiance measurements are defined with the constant MEAS_TYPE_I(41). Polarized measurements can be defined as Q,U (42, 43) or as polarization rate (44). It is also important to check how polarized data is going to be manipulated in the retrieval code based on inversion strategy defined in the settings file. Note that all processing will be considering range corrected profile for one wavelength. The procedure for other profiles from different wavelengths are exactly the same. Range corrected profile implies that at least the background noise was subtracted and altitude corrections were applied to the raw signal, but if it's possible to consider all other corrections (electrical noise and overlap correction, dead time correction, gluing analog and photon-counting signals and all others that your system may have), you should apply them. Step 1. Background noise subtraction and range correction. Step 2. Altitude range selection and signal cropping. The minimum Zmin and maximum Zmax altitudes are selected and the signal is cropped, so Zmin<Zi<Zmax. The minimum altitude should be selected as low as possible, preferably in the region where the overlap correction could be correctly applied. The Zmax should be selected from the following considerations: maximum altitude where the noise levels of lidar measurement are acceptable and the amount of atmospheric aerosols is still noticeable. In case if the lidar used is inclined The sounding zenith angle should be provided for the corresponding wavelenghts. The angle value should be placed in the position of the SZA corresponding to this wavelength. All SZA's for all vertical profile measurements should be the same. Vertically pointed lidar should have this value set to 0. Note: Keep in mind that retrieved aerosol vertical profiles will be retrieved for vertically projected altitudes, i.e. if your lidar is inclined, the maximum altitude of the profile will be equivalent to Zmax*cos(SZA). GRASP/GARRLiC can use arbitrary altitude/range scale. However, to keep number of retrieved parameters reasonable and to fight higher noise contamination of lidar signals at higher altitudes, it is recommended to use a logarithmical altitude/range scale with NZ points to represent aerosol profiles in the atmosphere. For that, we have to present all vectors (altitude/range vector and profiles of lidar signals) in logarithmically equidistant manner. After such procedure, the number of points in three main vectors reduced to NZ points in logarithmically equidistant manner. These values should be placed in places corresponding to the zenith wieving (vza or θv) angles for the vavelenths corresponding to lidar or vertical measurements. Hint: the altitude/range vectors for measurements at all wavelengths have to be the same. where A represents profile of lidar signal or molecular backscatter. Caution: integration have to be done using meters in altitudes. References: Anthony Bucholtz, Rayleigh-scattering calculations for the terrestrial atmosphere, Optical Society of America, 1995. The output module is responsible for managing results for each segment or entire tile and driving them to the correspond destination (file or screen). There are two kinds of main output structure into GRASP: tile and segment. 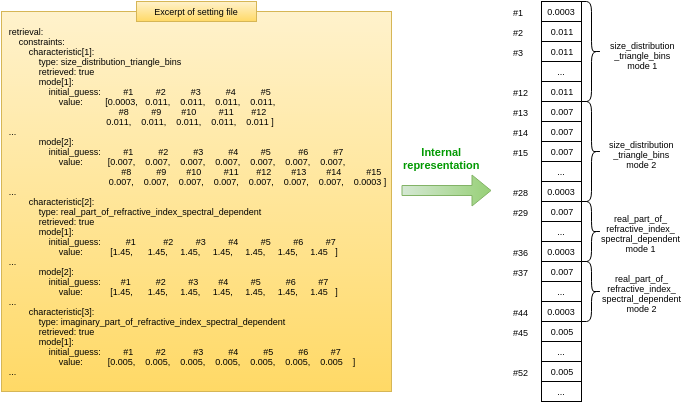 Segment output structure represents the output results obtained from the retrieval library. Then, core unit compacts it and stores it in a tile output structure, which contains the results of the entire process. output segment function: it is called after retrieving a segment and is called with the results of that single segment. output current function: it is called after retrieving each segment but it is called with the partial tile processed until that moment. In each call to this function, it gets a partial tile nearest to completion. Last call to that function will send the entire tile results. output tile function: at the end of the process, a function is called sending to it the entire tile results. It can print a complete map of the process. The output from GRASP is quite complex and strongly dependent on the settings used. As it was discussed in Section 4.1.2, “Retrieved characteristics”, there are two kinds of output products: direct and derived. Direct results are the values directly inverted in the initial guess array, then after obtaining them, forward model is called one more time to obtain the derived products. The list of direct and derived products obtained depends on the data and the inversion strategy selected (defined in the settings file). This chapter contains a complete list of products that can be obtained with GRASP, but it does not mean that all of them can be obtained with all inversion strategies. In the internal GRASP output structures there are some products that are repeated between direct products structure (array with the same shape as initial guess) and derived products. The reason is that for some applications they are direct information, for others they are derived results. This depends on input data and inversion strategy, defined in the settings file. GRASP has several forward models and each of them are used (or not) depending on the application. For example, to retrieve nephelometer data, just single scattering (particle properties) will be used. For other applications, GRASP has also a multiple scattering module (radiative transfer) and a lidar signal module. As it was explained in Section 4.1.2, “Retrieved characteristics” section, the retrieval algorithm works iteratively over an array of parameters (in its first definition it is called the initial guess), until it represents the best solution. This solution array has same shape as the initial guess (the same parameters and defined in the same position). Once it is obtained, a final call of the forward model with the resulting array provides a complete list of output products. For some applications, it can be useful to use the forward model without inverting any data. It can be done easily in GRASP with the use of the setting parameter retrieval.convergence.stop_before_performing_retrieval=true. When no retrieval is performed, just one call of forward model is performed. If in the initial guess array the user has set an aerosol model, it will be used inside of the forward model obtaining therefore an entire output structure, with information in all fields. This procedure can be used also to reprocess some data. If output parameters of a retrieval are stored, then they can be set as initial guess and then, running GRASP with the same settings, except for retrieval.convergence.stop_before_performing_retrieval=true the entire output can be obtained again. This procedure can be used to reprocess data with many objectives such as saving storage space (just save the output array of grasp and reprocess to obtain the rest, if it is needed) or obtaining extra products in the future. The previous procedure can also help to simulate the input data. It is useful because a valid geometry is necessary in the input data to set an SDATA file. In this case, an aerosol model is set as an initial guess and the code works just for the forward run. Then, by using retrieval.debug.simulated_sdata_file parameter, the user can set a path to the simulated files. A SDATA file will be dump to that path where the geometry is the same and the measurements are filled with the output results of the forward run. Then, this SDATA file can be used to self-consistency tests, where synthetic data is retrieved.